Koh Samet Island. White Sand beaches within easy reach of Bangkok. Blessed with the softest, whitest sand within easy reach of Bangkok, the tiny island of Koh Samet, is a favourite escape for Thais, expats and tourists. Such is the attractiveness of this 6Km long island, that over 300 years ago it was the inspiration behind classical Thai Poet Sunthorn Phu’s masterpiece Phra Aphai Mani ( A 30,000 line epic saga of Princes, Mermaids and Giants ). There are many reasons for any nature enthusiast to choose Koh Samet but the foremost is undoubtedly its close proximity to the mainland. Because it is just 200 kilometers away from Bangkok. Visitors only need to travel two-and-half hours by road to Ban Phe followed by a 20-minute boat ride to reach the island. So, after traveling for a morning, you will find yourself lazing on the beach at lunchtime. lts fourteen, small but dazzlingly white beaches are breathtakingly beautiful. They are lapped by pale blue water and in places still shaded by coconut palms. But they are also often crowded – esp[ecially at weekends. However, on weekdays there’s a lot more room to breathe and relax. All in all, the island is very developed with over fifty sprawling, low-rise, resort and bungalow developments. 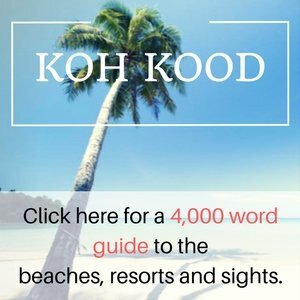 Much of the island’s coastline has been protected as part of the Mu Ko Samet National Park since 1981 and all visitors are required to pay the standard national park fee on arrival. Most hoteliers also pay rent to park authorities in order to improve the island’s infrastructure. Samet’s best beaches are along the east coast. This is where you’ll find nearly all the bungalow resorts. In addition, there’s one rather exclusive beach on the otherwise largely inaccessible west coast and the north-coast shoreline retains a more ‘local’ ambience. Most islanders and many resort staff live in the northeast, near the island’s main pier. Around this area is the sprawling, badly drained village of Na Dan, which has small shops and cheap foodstalls as well as Samet’s only school, health centre and temple. Na Dan’s high street, which runs from the pier down to Hat Sai Kaew and its other small roads, are paved, as is the road along the north coast to Ao Noi Na. However from Hat Sai Kaew south, there’s only one poorly maintained dirt road (with a branch west to Ao Prao) that runs down the island’s forested central ridge, and much of the interior is dense jungle, home to hornbills, gibbons and spectacular butterflies. The evergreen vegetation belies the fact that there are no rivers on this unusually dry island, which gets only scant rainfall in an verage year. Lack of rain is another plus point for tourists, though it means water is a precious and expensive commodity as it has to be trucked in from the mainland. Even in the rainy season of May to October you are likely to see less rain than any other island. Although not as lively as party islands such as Koh Phangan, Koh Samed still has a thriving nightlife. With its fair share of Backpackers and locals visiting on weekends, parties around the beach areas of Hat Sai Kaew and Ao Phai are becoming more common. It’s also easier and quicker to get to from Bangkok than other islands in the Gulf of Thailand, such as Koh Chang island in Trat province. Hat Sai Kaew and Ao Wong Duan are the biggest centres on the east coast, dominated by upper-scale accommodation aimed at families. package tourists and Bangkok trendies. Samet’s super-deluxe accommodation is on west-coast Ao Phrao and southern beauty Ao Kiu. Depending on whether you land up on weekdays or the weekend, there is a lot to do on this tropical island. For a nature-loving travellers who is looking for a soothing yet economical holiday, Koh Samet is where your quest would come to an end on any given weekday. Likewise, weekends are perfect for anyone who enjoys some nightlife as many younger Thais head here to party through the night. Pristine white beaches, banana boats, great night life and delectable food set against the backdrop of a protected forest area is what Koh Samet is all about.